My folks came up from Los Angeles to enjoy a couple of days of cruising with us. Our destination was La Conner and Roche Harbor. I had cleaned and prepared the boat the day before we were to leave, including loading up with 170 gallons of gas. This aspect was a little surprising because my gas gauge had indicated about an 1/8 of a tank left (capacity is rated at 170 gallons). We set out for La Conner Saturday morning, leaving Kirkland around 10:15am. This was the first day of SeaFair and there was a dramatic volume of boats heading into Lake Washington. The Montlake Cut was the busiest we had ever seen. We felt like a salmon running upstream. Our wait at the small lock was less than an hour and we used “Sit, Stay” (SkyHook) to keep us in place during the wait. By the time we got out of the lock it was a little after noon. We should have taken our time waiting to have had lunch, but we always seem to forget and get caught up in the excitement that surrounds locking. Eating on our way to La Conner was thrilling and fun. At 27 knots there’s a fair amount of shaking and my folks and Lila were bouncing around while trying to enjoy their sandwiches and beverages. Since this episode we’ve acquired a box of straws for the boat! We made it to La Conner before 3pm. Cathia and my Mom practically leaped off the boat to make it to the shops before their planned 5-6pm closing times. Lila, my dad and I finished docking and took the bags over to the Channel Lodge, where my folks were going to spend the night. While the LAIKA is plenty roomy and comfortable for a few people, it’s not big enough for all of us! Dinner in La Conner was at Nell Thorn. While we had previously had a superb meal there, this time the staff dropped the ball and our main courses were delivered out of sequence. The crew wasn’t happy and the overall meal turned out to be a disappointment. This was regretful because there’s so much to like about that restaurant. We must of simply caught them on a bad night. Sunday morning we met at The Channel Lodge for breakfast. My folks reported a restful night. The hotel seemed very nice. We wheeled their roll-aboards back to the boat (located just a block away) and prepared to depart for Roche Harbor. Close to departure time Cathia discovered a contact from The Children’s Garden that have a summer home in Fish Creek, an inlet at the very Southern point of San Juan Island. We decided it would be fun to stop by an say hello. 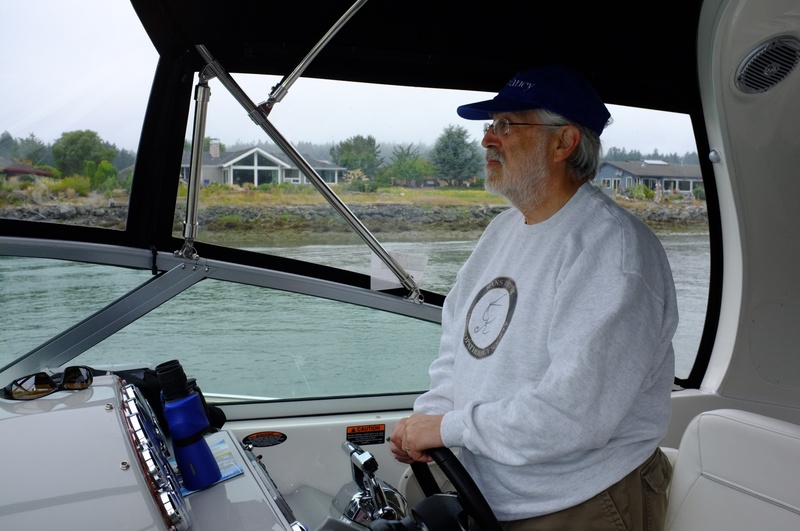 Normally we’d head out the Northern route of Swinomish Channel, toward Roche, but since we were, essentially, going Westward toward San Juan Island we decided to head back the way we came, through the “million dollar mile” and go through Deception Pass. The last time (and first time) we went through Deception Pass we coordinated our cross for slack time, despite lots of friends suggesting that the LAIKA wouldn’t need to be overly cautious (due to our size and engine capacity). We put that to the test and motored through two hours before slack tide. While we could see and feel strong inflowing currents, the LAIKA did just fine. What we met on the other side, though, was a surprise – and something entirely new for us. Fog! Thick, soupy fog greeted us almost immediately after we made it through Deception Pass. We had never navigated in fog, let alone really thick fog. So, we powered up the radar and set our speed for 10 knots. The LAIKA doesn’t like going at 10 knots, and its hull wasn’t designed to be held back. Not only do the engines have to work harder and burn more fuel, but the bow rides high and there’s lots of noise. It’s like pushing a truck full of water in front of us. Still, we had no choice. Navigating in fog can be tricky and is inherently dangerous. We activated our auto-pilot so the LAIKA could be guided by our chart plotter and set up three sets of eyes to watch for traffic. I decided to sound the horn every two minutes as an extra measure of safety but I’ve been told that it’s largely a useless practice. I didn’t hear any other fog horns during our slow crossing toward San Juan Island. I’m happy to report that the journey, though extremely slow and eerie, was successful. The chart-plotter did its job and the radar provided the necessary security that helped us avoid collision. 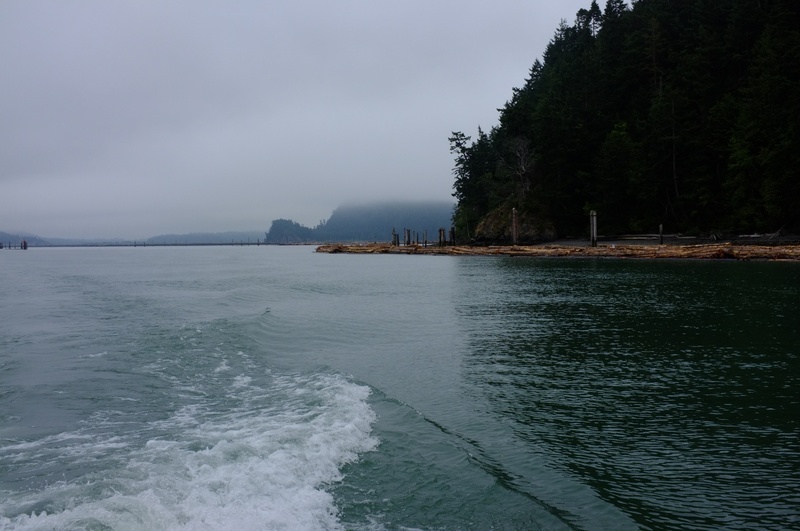 On several occasions, as we got closer to San Juan Island, we’d note a “contact” on radar and then see it slowly appear in the near distance, only to be quickly swallowed, again, by fog. Once we turned in toward Fish Creek the fog lifted and we were greeted with bright, warm morning sun. 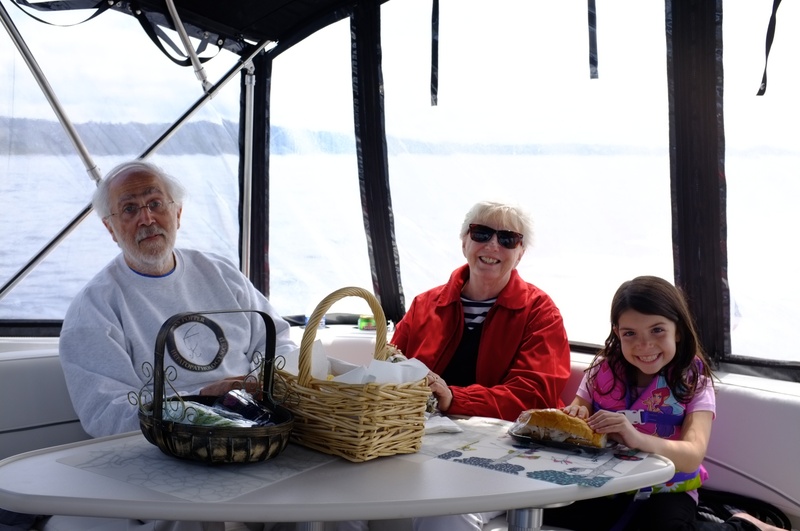 We stayed about an hour with our friends before deciding it was best to get back out and head toward Roche Harbor. We decided to stay on the East side of the island and head straight-up, past Friday Harbor. While we’d likely miss the chance to see Orca pods on the West side, we were worried about more fog and wanted to get to Roche early in the afternoon. As we left Fish Creek we entered into fog, but only for a little while, and it wasn’t as thick as we had seen earlier in the morning. Before long we were through it and could resume a 25-28 knot speed toward our destination. When we reached Roche Harbor we were surprised by the number of boats. Since this was only our second time visiting, we didn’t realize it could become so crowded. The bay was packed with anchored boats and the VHF was buzzing with new arrivals awaiting slip assignments. Thankfully we had previously reserved a slip and after a short wait got assigned D-03, which is on the main dock, away from the older, original guest dock. We found our slip, backed in and were darting up the dock toward the “town” in short order. 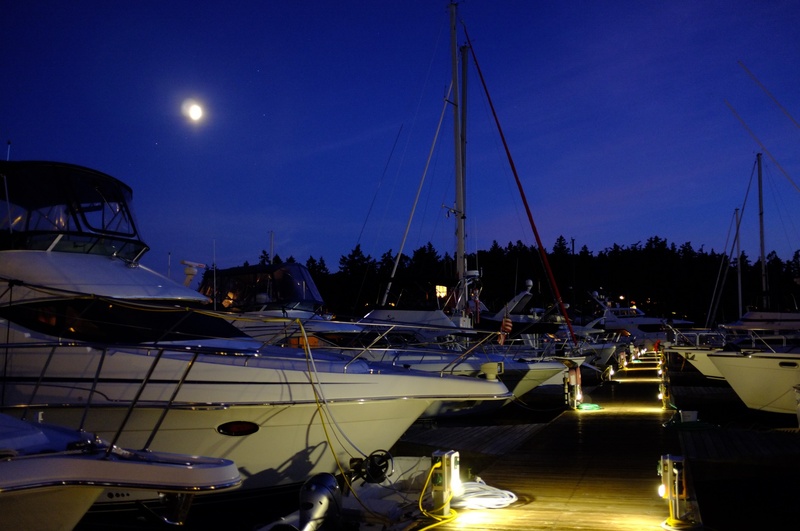 Our plans called for us to spend the afternoon and evening in Roche Harbor and depart early the next day. My folks had a room reserved in the Hotel de Haro. The hotel is quaint. The charm, I suppose, is that it’s historical. I’m glad we were staying on our boat. But, I heard the room, with a shared bathroom, was fine. My folks enjoyed the sculpture garden while Lila enjoyed a play structure in the park and, later, swimming. We had an excellent dinner at McMillin’s Dining Room and all retired fairly early. Monday morning we enjoyed fresh donuts and coffee and prepared to leave. I decided that we’d skip pump-out and refueling in order to make it back in plenty of time to get through the locks and get my folks to the airport for their 8:15pm flight. The decision to skip refueling was, in hindsight, a mistake. While the gas gauge read just slightly under 1/2 full, I should have realized the distance we had traveled and the likelihood that it wasn’t very accurate. But, that was in hindsight. Monday morning we set out toward Seattle, following a new course to Friday Harbor where I’d pick up and re-use a previously saved route from Friday Harbor to home. After we had made it through Deception Pass our fuel gauge began revealing what was probably a clearer indication of available fuel than we had previously seen and, while not alarmed, we began making plans to stop and gas up. We ended up making it to Everett Marina but, quite honestly, it was probably on fumes. We took on 182 gallons of fuel! While the voyage, to this point, had been successful, I’d mark this as a failure on my part to properly plan and navigate. I should have been logging fuel more accurately. While we didn’t end up running out of fuel, we were close. Sure, we could have received aid from Vessel Assist, but that could have also placed us in danger. Imagine running out of fuel in a shipping lane or in rough waters. The event was a teachable moment and the lesson has been learned! Despite the dining snafu in La Conner and the fuel experience, the trip was a delight. Fast. Fun. Everyone seemed to enjoy it and, despite the fog, the weather was great. Beside realizing that fuel management needs to be performed better, it’s also clear that two days is too short a time to visit the San Juan Islands.